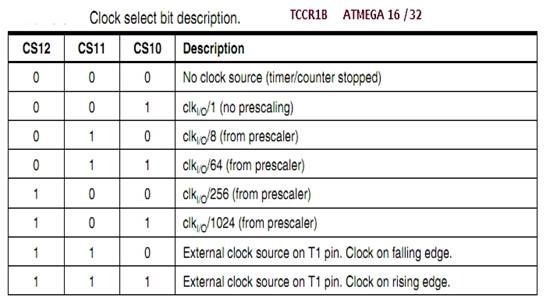 ATMEGA 16/32 has 3 TIMERS —TIMER0 8 bit , TIMER 1 (16 Bit) , Timer 2 (8 bit). In the previous post we tested with TIMER0 . 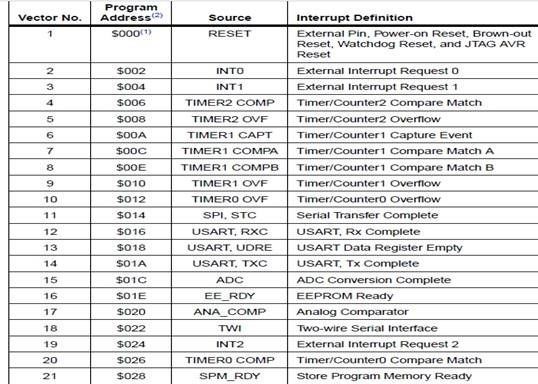 This post is related to TIMER 1 , particularly the INTERRUPT functions. As we know Timers work by incrementing a counter variable called counter register. The counter register can count to a certain value, depending on its size. The timer increments this counter one step at a time until it reaches its maximum value, at which point the counter overflows, and resets back to zero. Since Timer1 is 16 bits, it can hold a maximum value of (2^16 – 1), or 65535. In order to increment the counter value at regular intervals, the timer must have access to a clock source. The clock source generates a consistent repeating signal. Every time the timer detects this signal, it increases its counter by one. So , if we need a one second delay ( 1000msec) , 1000/0.0082 = 121951 which obviously higher than 65535 which is the highest count for TIMER1. After counting 65535 , The timer normally sets a flag (OverFlow Flag) bit to let you know an overflow has occurred. 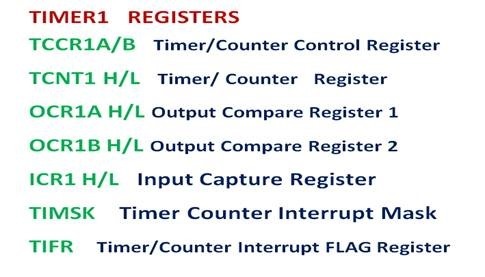 When the timer counts past 65535 (0xFFFF) , it sets the Flag TOV1 (bit 2 of TIFR ) register.The registers TIFR & TIMSK are common for all 3 timers. When Compare register is used , the OCF1B or OCF1A flag is set according to the channel (A or B) used for Compare operation. Instead of manually checking the Flags in TIFR , Interrupts can be used to trigger ISR automatically when the particular Interrupt bit is Enabled in TIMSK register. First example code is using OVERFLOW INTERRUPT. To start with include the 2 Header files at the top of code. Inside the Main Function PD6 pin is made as OUTPUT , as we’ve connected an LED at pin20. The prescaler we’ve selected is 256 .To apply this we need to set the bit CS12 in the TCCR1B register.In Timer1 the control register is of 2 parts TCCR1A & TCCR1B . Prescaler select bits are found in TCCR1B. Timer 1 counts from 0 to 65535 & overflows. Inside the ISR Function we toggle the LED at PD6 & THEN AGAIN LOAD THE TCNT1 Register with the calcuated value.This is important as otherwise the TCNT1 will start counting from 0. Compile the code as we’ve done in previous examples & upload the HEX code to see the LED blinking at 500 msec delay. In compare mode, there is one compare register, where we can set value to compare with the Timer / counter register value. Once the compare value matches with timer / counter register value, compare match occurs. This compare match event can be used for waveform generation. 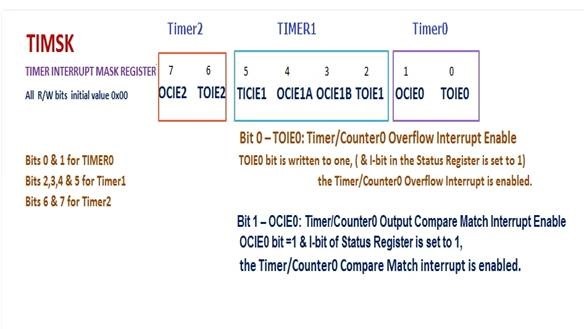 The Timer counts up until the value of the TCNT1 (Timer / counter register) register becomes equal to the content of OCRx (Compare register). 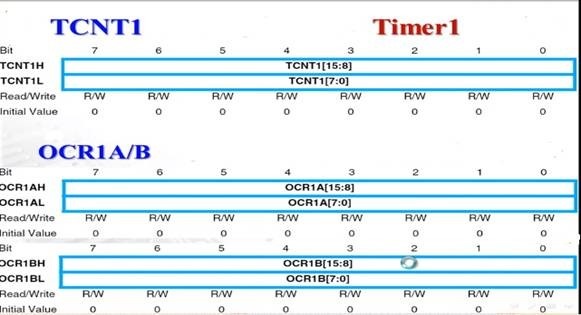 As soon as TCNT1 becomes equal to the OCRx, compare match occurs and then timer will get cleared and OCFx flag will get set. First we enable the CTC mode by setting the bit WGM12 bit of TCCR1B. 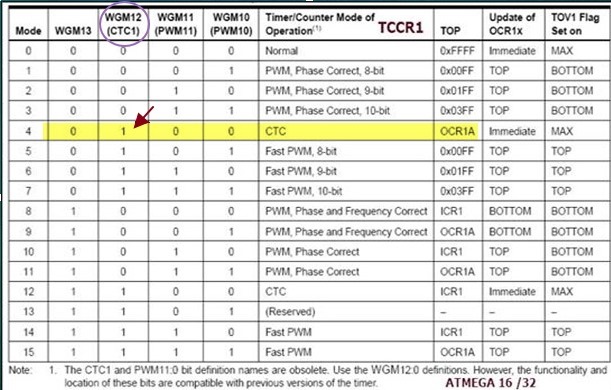 The WGM bits are found in both the registers.But we need to set only the WGM12 bit to enable CTC. This bit is found inside TCCR1B Register. So no need to set the TCCR1A register. We then initialize the TCNT1 value to start from 0. When the TCNT1 value reaches a compare value , an interrupt is enabled. This compare value is loaded into a OCR1 x Register. The Output Compare Register 1A – OCR1A and the Output Compare Register 1B – OCR1B are utilized for this purpose. Since the compare value will be a 16-bit value (in between 0 and 65535), OCR1A and OCR1B are 16-bit registers. 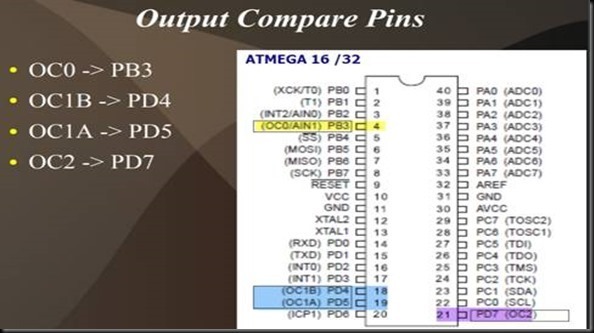 In ATMEGA16/32, there are two CTC channels – A and B. We can use any one of them or both. Let’s use OCR1A. 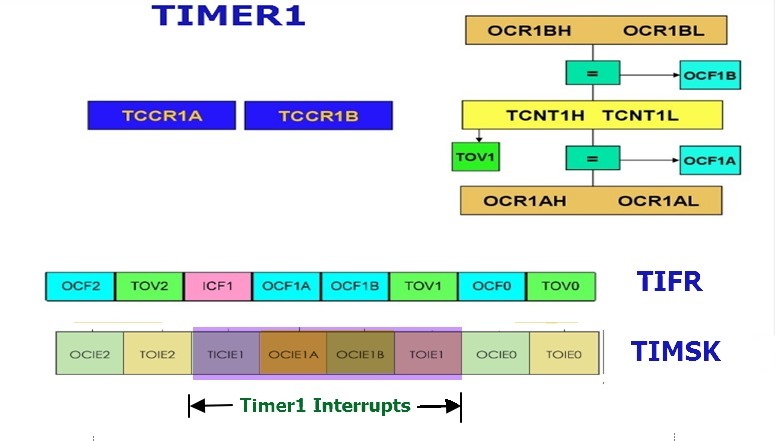 Whenever a match occurs (TCNT1 becomes equal to OCR1A ), an interrupt is fired (as OCIE1A is set) and the OCF1A flag is set (we do not check this flag manually, as we use interrupt). Now we need an Interrupt Service Routine (ISR) to attend to the interrupt. Executing the ISR clears the OCF1A flag bit automatically and the timer value (TCNT1) is reset. These are the Output Compare pins of TIMER0, TIMER1 and TIMER2 respectively. Simply set the timer1 to the mode 01 as seen in table above. Whenever a compare match occurs, the OC1A pin is automatically toggled. Thank you for your contributions. I have learned much from several of your videos. Keep up the good work!